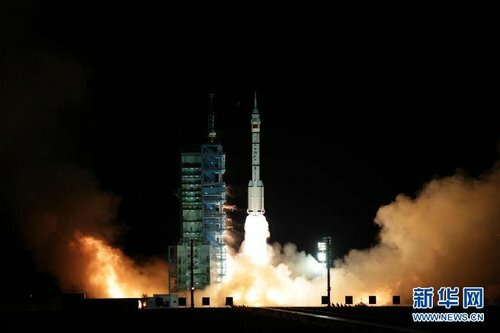 JIUQUAN, Nov. 1 (Xinhua) -- China's unmanned spacecraft Shenzhou-8 blasted off at 5:58 a.m. Beijing Time Tuesday from the Jiuquan Satellite Launch Center in northwestern desert area. The spacecraft, carried by a modified Long March-2F carrier rocket, is expected to dock with Tiangong-1 space lab module that was sent into space on Sept. 29. The rendezvous and docking maneuver will take place within two days after the launch of Shenzhou-8, and the practice will build up experience for further docking with Shenzhou-9 and -10 in 2012 and the building of a permanent manned space station around 2020.